A subscription from IDTechEx allows you to access our full body of market, technology and company data through our online portal in combination with direct analyst engagement. Each subscription is tailored for your needs; providing access to the most relevant reports, topics on our portal and appropriate analyst time ranging from support time to onsite strategy sessions and bespoke briefings. Subscriptions are typically annual. IDTechEx provides detailed market forecasts on a range of emerging technologies. These forecasts are supplied using our interactive online platform, The Market Intelligence Portal. This enables you to visualize our data online or even download the actual data to do your own analysis. IDTechEx analysts are available as part of your subscription to answer questions about our assumptions and methodology. A full list of existing forecasts within the portal is available here. IDTechEx also provide weekly premium articles which provide a snapshot of the market opportunity on a specific technology. These executive summary-style articles are only available to subscribers and align with our research programme. A full list of existing premium articles can be found here. Subscribers will also have access to our market research reports which are the pillars of our market research. There reports invariably provide technology assessments, application analysis, competitor intelligence and latest news/trends. A full list of our existing reports can be found here. You can keep up-to-date with the latest developments around a specific technology by using our Market Intelligence Portal. You can use our customisation or research tool to focus only on content that is relevant to a specific technology. This way you will always see our latest content around that topic. Our weekly newsletter will also communicate all our latest releases. You can also discuss your needs with our analysts and they will actively push information and insights to you as they learn it. IDTechEx interview-based company profiles provide extensive primary business intelligence on your competitors’ activities, enabling you to learn about their technology developments, target markets and business strategy. The IDTechEx benchmark enables you to rank different companies within a sector on the basis of key parameters such as product value proposition, state of technology/product development, medium-term commercial opportunity, IP and know-how and competitive landscape. A full list of existing company profiles is available here. You can visualise our benchmarking tables and assign different weights to different parameters to meet your objectives. IDTechEx also has an extensive database of more than 2,000 company presentations on file (PDF and audio) collected via its bi- or tri-annual global conferences. IDTechEx analysts author weekly premium articles that assess the latest technology and market developments within a field. They provide snapshots of the market or detailed and concise technology assessments and updates. These executive summary-style articles are only available to subscribers and align with our on-going research programme. Our webinars also provide market and technology overviews, making them a time-efficient method of capturing information. A full list of existing premium articles can be found here. Our analysts will actively push the latest information to you if you discuss your needs with us. Our team travels the world extensively to learn the latest information so that, together with our extensive network, we are up-to-date and hear about new developments first. IDTechEx analysts attend most high-profile events on their topics of expertise around the world. They write summaries of key take-away messages and points from these conferences for the benefit of our subscribers. You can also join our network of conferences as a subscriber. This option will enable you to see and hear the latest information and network with key players. We organise conference on all our topics of expertise. For more information visit our events pages. IDTechEx has an extensive network of contacts that it has accumulated by organising three annual conferences across the world for the past decade and also by investing heavily in traveling to meeting clients. Currently, IDTechEx has 200,000 relevant contacts within its database. IDTechEx analysts can help you identity the rights contacts for partnership and/or sales depending on your agreement with us. If you discuss your needs with us, our team will keep you in mind when attending conferences around the world and actively push contacts onto you. You can also join our network of conferences and tradeshows. This option will enable you to see and hear the latest information and network with key players. We organise conference on all our topics of expertise. For more information visit our events pages. IDTechEx interview-based company profiles provide extensive primary business intelligence on companies. Our domain experts carry out the interviews, meaning that they can ask the right questions and distinguish between reality, hype and sales pitches. Our domain experts will also carry out SWOT analysis on each profiled company after having studied the topic and interviewed enough companies within the field. Our analysts will also benchmark each company on the basis of five critical parameters: 1) product value proposition, 2) state of technology/product development, 3) medium-term commercial opportunity, 4) IP and know-how and 5) competitive landscape. The latest news about each company is always associated with each company and as is all their latest presentations at our conferences. The expert interviewer will also be available to answer questions about specific companies on request. A full list of existing company profiles can be found here. You can also request specific companies to be profiled or added to our research programme depending on your agreement with us. Technology and market research reports from IDTechEx’s existing portfolio of reports. Executive summary-style snapshots of the market or detailed and concise technology assessments and updates on specific technologies. Granular, segmented and supported ten-year market forecasts. Visualise our data online or download a spreadsheet to do your own analysis. Learn about our assumptions. Company profiles based on direct interviews with organizations across the value chain. 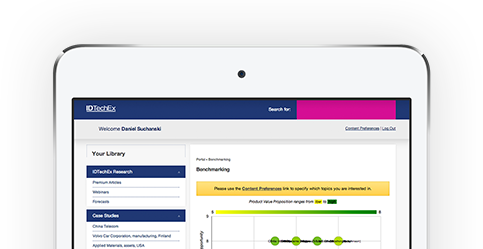 Use our interactive tool to benchmark companies based on the unique IDTechEx Index and visualise company rankings. Watch IDTechEx's webinars during and any time after the live broadcast. Access to over 800 presentations given at past IDTechEx conferences and tradeshows, with more being added after each future event. Summaries of key developments and learnings from conferences and tradeshows attended by IDTechEx. Dedicated technical analysts will spend time discussing your key technology and business questions. Interact with our analysts to connect with our global network of more than 150,000 contacts. Dedicated technical analysts will work with you during interactive sessions to develop solutions for your technology and business needs and challenges. IDTechEx maintains extensive case study databases on several of its topics, helping you see what is and is not successful.